It seemed like a good idea at the time. Go on a road trip to visit my new mother-in-law with our brand new five-week-old baby in tow. Hang on. Now that I know what I know, that was the worst idea anyone has had. Ever. A 16 hour road trip with a breastfeeding newborn? What could possibly go wrong? It wasn’t like we weren’t being vigilant. We broke the trip up over two days and during those two days, we stopped every two hours for breastfeeding breaks. However, by the time we got to Noosa, our little baby was screaming his head off. He wouldn’t settle, he only slept in short bursts of 20 minutes and did I mention that he wouldn’t stop screaming? It seems completely obvious now, but in my defence, I was a new mum and I just thought it was the usual newborn problems. I assumed that all babies screamed their heads off morning, noon and night. I also assumed that life, as I knew it was now over and this was what being a new mum was about: no sleep and a baby that screams in your face all day. Meanwhile, still not putting two-and-two together, I thought I was doing a great old job of breastfeeding. I wasn’t letting it slow me down, I was just doing it on the go. I was playing hands of cards whilst breastfeeding, having a chat whilst breastfeeding and breastfeeding at the beach. All of which is fine, if you are a super-awesome breastfeeder. Which I have since discovered I am not. I am one of those women who needs to really focus to make the whole thing happen properly. And as it turned out, my baby wasn’t getting any. After a few days of all-night screaming, my mother-in-law suggested I take him to the local baby health centre. I poo-pooed her. I knew what I was doing. I could take him to the baby health centre when we got back to Sydney. It could wait. And so, rolling my eyes because she was such a “meddler”, I went. When I walked into the baby health centre I cursed her again: it wasn’t an appointment she’d booked me into but a mother’s group session for new mums. I sat in the circle with my screaming baby and waited my turn to tell everyone who I was and what I was doing there. By the time it came my turn, the nurse had taken my baby and was trying to settle him for me. I made some flippant comment about how I was having “some settling issues” and hoped to just get the hell out of there as quickly as possible. She asked me some questions about my breastfeeding: how often was he feeding, was he latching on properly etc. etc. Then she took my perpetually angry baby and put him on the scales. “How much did he weigh when he was born?” she asked. Which was when the mood in the room went from “standard check-up” to “oh my god it’s an emergency” in a split second. She handed him back to me and started rummaging through her cupboards. “He’s dropped below his birth weight.” She said with an edge to her voice. She started mixing up a bottle of formula there and then. It was THAT urgent. My stomach dropped through my bowels. My whole body was tingling with panic. My brain started to madly backtrack through the past 10 days and the screaming, all of the screaming. Why had I been so cavalier as to assume I knew what I was doing? When he was done, he just closed his eyes and drifted off to sleep. He settled. Something he hadn’t done for weeks. It dawned on me then that my baby had been screaming because he was starving. Could there be any worse report card for a new mother? I mean, I had ONE JOB! 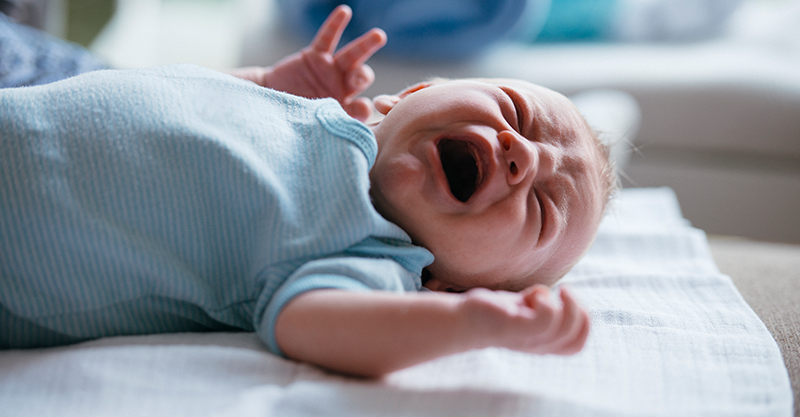 I returned to the house, shame-faced, humiliated and with the tin of formula and all the bottle-feeding paraphernalia the nurse had bundled me out the door with: the baggage of a failed breastfeeder. My mother-in-law, did not gloat, she did not say, “I told you so,” she simply offered to take him for a feed if I wanted to rest. To be honest, it was the beginning of a better relationship with her. I realised she hadn’t been “meddling” she had simply been trying to help. Because as much as it’s annoying when older women try to give you advice, as a new mother, you really should listen to your elders. That’s what the matriarchy is for: advice from those who’ve been there. The following day my husband and I went to a paediatric appointment at the hospital. There we were to find out if any permanent damage had been done to our little baby by my breastfeeding balls-up. “This will be the first of many times we will worry.” And I was right. It was the beginning of parenting for us. An inauspicious beginning, but a beginning nonetheless. The doctor looked our tiny baby over and gave him the all clear. He was fine. My husband and I, however, were shell-shocked. Only five weeks into this parenting thing and, like so many new parents before and after us, we’d already faltered. I’ve never written about this in detail before because to be honest, it was so confronting that I just put it in a part of my brain marked “do not open ever”. I haven’t thought about it properly for 18 years. Even now, the thought of it makes me feel deeply uncomfortable and ashamed. The photos of Max at that time, I’ve destroyed them all. He was skin and bone and looking at them made me want to cry. They only served to remind me of how badly I failed him in his most vulnerable early days. As for my mother-in-law, we became very close over the ensuing years. I will be forever grateful to for her gentle interfering ways. *If you have any concerns about breastfeeding, book in a chat with your GP, Maternal Child Health Nurse, or give the Australian Breastfeeding Association a call for advice.